Friends who share a love for running! I love the great feeling after a race or training run! To stay healthy and fit so I’ll be able to run throughout my lifetime. To be able to spend time with my friends and share life’s experiences on our training runs and road trips. 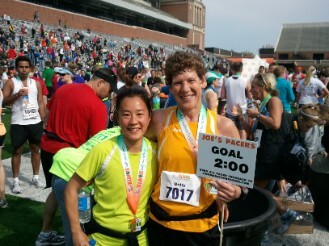 My first marathon…Chicago 2003 when I ran with the pace team and qualified for Boston! To be able to give back to the sport that has given so much to me! To help others attain their own personal goals! Pacing St. Louis 2009 half marathon I had a women who was celebrating recovering from a major stroke and it was her “comeback” race. We finished together! 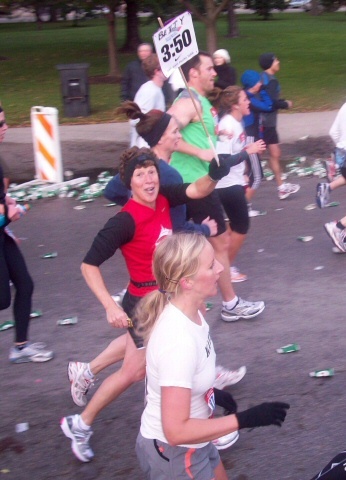 Also pacing the 2008 Detroit Marathon when a member of my pace group was a member of the NYC Police Department during 911 and told us a bit of his experience. We dedicated mile 11 to Officer Mike! To be motivated and energized every step of the race! I will offer running tips, hydration & gel reminders throughout the race. Keep close to here some crazy running stories! Use a checklist to get everything you need for the marathon the night before to relax and get a good nights sleep. At the race start ….start behind me and finish ahead of me!!! Remember…you’ve trained and prepared! Enjoy the race as its your celebration!! !